“…that which we call a rose by any other name would smell as sweet.” is the often quoted Shakespearean line. The “rose “ with a new name is the demonstration garden at the UF/IFAS Leon County Extension Office, located off Paul Russell Road and Zillah Street, was recently dedicated in honor of its long time designer and developer, UF/Leon County Extension Agent Emeritus, David W. Marshall. It is the same beautiful, teaching garden for residents of Leon County and the surrounding area first established by David Marshall in 1999. It smells just as sweet, but it has a new name in his honor, recognizing his hard work and years of dedication, teaching residents, home owners, business owners, horticulturalists and others about horticultural practices and plants that are best for our area. A new sign was installed to mark the name change and dedication at a recent Open House event. Over 543 plants, including beds with sun loving plants, shade loving plants, tropical plants, roses, annuals, perennials, native plants, shrubs, trees, vegetables, herbs, grasses, orchards, vines and non-invasive plants inhabit the David Marshall demonstration garden. The plants are either well suited for our climate zone or are being tested to see how well they perform here. All plants are labeled with the binominal scientific name, common name if known and date of planting for self-guided tours Monday through Friday, from 8 am to 5 pm. Free tours guided by an Extension Agent or Master Gardener may be arranged for groups by calling the UF/Leon County Extension Office at 850-606-5202. Twice yearly an Open House is held at the gardens in the spring and fall that features walking tours, information booths, displays, music, refreshments, plant sales and demonstrations. Please watch for notices about the exact dates. The Demonstration Garden was initially started in 1985 at Tallahassee Nurseries where Master Gardeners were offered a piece of the nursery to use as a Trial Garden for plants that had not been used frequently in our area. The purpose of the Trial Garden was to monitor the performance of these new plants. This Trial Garden was maintained for 14 years. 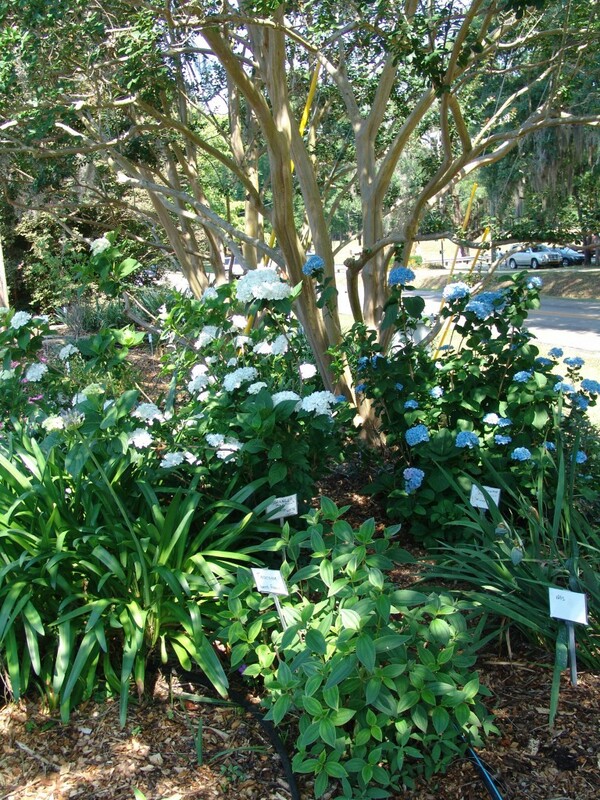 In 1999 the Trial Garden was moved to the grounds of the UF/Leon County Extension Office to serve as a teaching tool. Initially, three beds were established. Later, due to popular demand, they were expanded to five. In 2006, a rose garden was established which features old garden roses that are more carefree in our climate. That bed was expanded to include tropical plants, some of which did well here and others, not so well. Micro-irrigation was introduced in 2011. That same year, the water source for this supplemental irrigation in the Demonstration Garden was revamped to include two large cisterns. Also in 2011, due to the increased interest in home food production and community gardens, a vegetable garden was developed, where many different cultural practices and plants have been tested to see what performs best. Yields were shared with Second Harvest, a food sharing organization. A garden featuring succulents and cacti was added in 2013 which requires no supplemental water. The most recent addition is the orchard with peach, nut, apple, pear, citrus. olive trees and many others. How will this garden continue to grow and develop? It will be exciting to watch. Our community is grateful for the only public garden of its kind in our area which is free and open for all to enjoy and from which to learn. The David W. Marshall Demonstration Garden is a lasting tribute to a dedicated, long-time teacher in the fields of horticulture and gardening and a sweet gift to the citizens and gardeners of Leon County. Thank-you David W. Marshall.